A COMMITTEE set up by the Union Ministry of Environment and Forests has confirmed the existence of wetland at the thermal plant near Sompeta and the Bhavanapadu thermal plant site near Kakrapalli village in Srikakulam district of Andhra Pradesh. The committee pointed out that the 2,640 MW proposed power plant at Sompeta, by Nagarjuna Construction Company (NCC), and the 2,640 MW Bhavanapadu plant, promoted by East Coast Energy Pvt Ltd (ECEPL), would irreversibly damage surrounding wetland and ecology. The environment ministry had commissioned its regional office in Bengaluru to inspect the two controversial sites. The four-member team toured the sites between July 17 and 19. In its report, the team pointed out the state administration distorted facts. NCC and ECEPL had submitted studies by research organisations and the state government to substantiate their claim that the projects were not in the wetland area. Based on this, the environment ministry's expert appraisal committee (EAC) granted them clearances. But the inspection revealed the mandatory environment impact assessments (EIAs) had been conducted during dry season (March to May), giving a skewed idea of the area's ecology. The team's findings reiterate what the National Environment Appellate Authority found during its field visit of the Sompeta project in June. The NEAA was hearing an appeal against the plant's environmental clearance. On July 15, the authority cancelled the clearance. The appeal against the Bhavanapadu project is pending. NCC had submitted a report to show that its project did not require clearance under the Coastal Regulation Zone (CRZ) Notification of 1991 because it was not influenced by tidal action. The claim, accepted by EAC, was proved false by the appellate authority and the Bengaluru team's site visits. "EAC gave the clearance based on the fact that stringent mitigation measures were made mandatory. The committee also considered it because quite a bit of money, especially public money, had been spent on the project," Asha Rajvanshi, an EAC member, said. 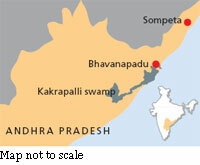 In the case of Bhavanapadu, the appraisal committee had asked ECEPL to move the project; its sub-committee had found the site was an important wetland. The company tried to sidestep by claiming it had erroneously marked the region as mudflats, which indicate presence of wetlands. The company submitted reports that included documents from the state government and a high-tide line study from the National Institute of Oceanography in Goa. The study stated that the area was not in CRZ. The institute certified the place is flooded only seasonally, but the company used this to show the area was not a wetland. EAC will now examine the Bengaluru team's report. "After all these reports how can the matter go back to EAC? The ministry should just cancel the clearances," said E A S Sarma of Forum for a Better Visakha who has been involved in the protests against the two projects.